If you’ve ever thought to yourself “Man, I’d love to have a Facebook Messenger chat with Miss Piggy from The Muppets,” now is your time to strike. Head on over to her Facebook page. 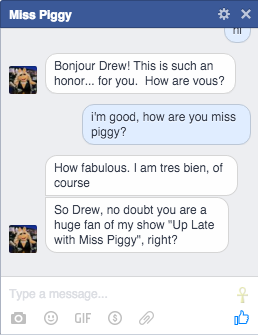 I think having a conversation with Miss Piggy will give fans a good idea of what I go through every day. I think everyone will learn something, plus I’ll get an hour of peace and quiet while she’s chatting with fans. Win-win! This is a promotion for The Muppets show that airs on ABC at 8pm on Tuesdays. The AI technology was developed by Disney Consumer Products and Interactive Media Labs and is powered by Imperson. Get used to these kinds of chat bot promotions, because with all of the apps out there like Line, WhatsApp, Messenger and more, brands are lining up to get a piece of the pie.